Re: Andrew's Updates | 2012/2013 Rosters Out Now! Does my court's work with the updated rosters? c0nr4d wrote: Fixed the issue. For some reason, the fresh install didnt get rid of old "hidden" viv and fsh files i had in the LIVE 06 folder(s) from editing stuff with DOLFFIN. Now it's good to go, though, and I've already started a dynasty with my beloved Wolves! Thanks again, Drew! Good to hear. S_Brat is working on some team face update packs at the moment, so as soon as I have a more up to date face for Pekovic, I'll be sure to include it. Hiiipower wrote: Does my court's work with the updated rosters? Dc311's conversions of them do; those are the ones that are included in the update. Oh ok Thats great of what Dc's doing more power to him. A post on our Facebook page reminded me that I never got around to updating the ESPN Game Intro Logo with the new NBA on ESPN logo, so I've whipped up a new version. Thanks Andrew and to everyone who contributes to the NBA Live Roster Project! To keep this going means a lot to many of us! 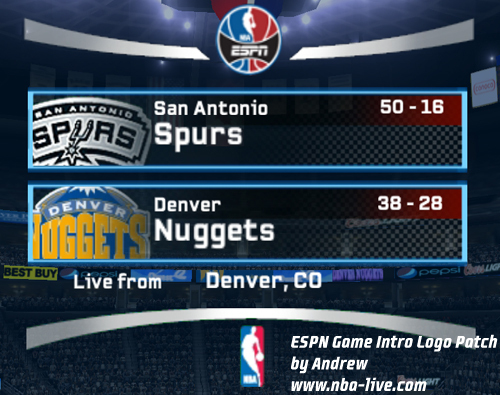 I only play NBA Live 06 once the Playoffs roll around and I always look forward to the Update! A few questions, probably address elsewhere and I apologize if it has. 1) Is OKC's commentary supposed to say "Seattle?" 2) Are there some star players, like Russell Westbrook, that do not have their name announced? Not a complaint by any means, I just want to make sure I'm doing everything correctly. 1. Yes. There's no way to change that. 2. The rosters do include some updated speech files so most players who were in the league by 2008/2009 should have their names called, but I can't remember if everyone is accounted for. The person who made the speech updates isn't around anymore. Thanks. Another question . . . I installed your Playoffs logo mod and in Brooklyn, it overlaps the stadium name. Am I doing something wrong? No, it's an issue with the stadium's files. Hopefully a fix can be created and converted for use in the 06 update, unfortunately not much I can do about it until such time as that happens. I downloaded the roster update pack. That's great, added to Live 06 (with 05 imho best Live game on PC talking about gameplay, plus a better graphics) sounds so good. I notice one little thing. In the update for those two games Lakers court doesn't have the new look with symbol surrounded by stars and other little changes introducted last summer. Only in 08 update court is in real life current style. Previous two games have still the old Lakers livery @Staples. By the way, I'm new here and I can't figure what u have been able to do every time I play these games with current roster installed. Such an impossible thing to my eyes, I can say only...wow. At the time of release, I didn't have updated courts for a few teams. Since then, Dc311 has converted some more courts for use with 2005 and 06, so I'll be able to add those in the next release. They are also available in the Downloads section right now, so alternatively you can download them yourself and get them into your game in the meantime. For the record, there's no need to post here and PM me the same question. One or the other is sufficient. Because I've had to use face updates from NBA Live 07/08 in the 2005 and 06 rosters, I don't always have proper hair shape files for the latter games, so a few faces won't look quite right. There's nothing I can do about that unless I'm provided with an appropriate face and hair update, I just have to make do with what I've got. 'Drew, you gonna do us the honor of Suns and Pelicans logo updates? Maybe. I'm still mulling whether or not I'll still be doing any updates. maybe you can include the front end and naming update from the "Hornets" to the "Pelicans" with this download too? 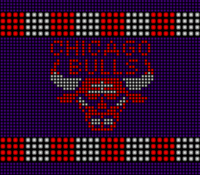 I suppose I could include a batch file that would automatically edit any roster. But that may not be necessary long term, as indicated in the above linked podcast. Good news about the post-draft roster update for the NLSC roster, Drew. I'll be sure to make the Suns and Pelicans uniforms for Live 06 once their designs are released. That'd be awesome. It'd also cover 2005, since it's easy enough to convert between 2005 and 06 (or if the numbers/sizes are all suitable, no conversion is needed at all). Haven't been here in a long time, but i'm glad that Andrew is still doing a fantastic job. This was one of my favorite places and it still is. Glad to see that the rosters are still up to date, i will certainly use them. Not quite up to date at this time, but I'll see what I can do. Thanks for the kind words. will this be updated for this season too? or you kind people doing all this good work have retired from 06?